We all like to feel great at Christmas … there can be few things worse than feeling bloated and overweight for the party season and on the big day itself. This is why our Rejuvadetox treatments prove so popular at this time year, and this is why we are giving 25% of a course of treatments to 5 lucky competition winners. Rejuvadetox is a 40 minute electronic, lymphatic detox treatment coupled with a 1,500 + calorie a day food plan of natural healthy foods allows the body to purge unwanted intestinal plaque and toxins from the body. Unlike other slimming programmes, it is the internal congestion within our bodies that Rejuvadetox focuses on. Rejuvadetox can help you : lose weight – that stays off; lose inches from stubborn places; feel and look ten years younger; drop a dress/suit size in one month; ease/eliminate health issues; enjoy renewed energy and vibrancy; lose weight whilst eating normal healthy foods all day; de-stress and sleep better than you have in years. 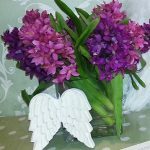 All you have to do to be in with a chance of winning is to spot these angel wings (pictured here next to a vase of flowers) hidden in one of our Rejuvadetox treatment rooms. 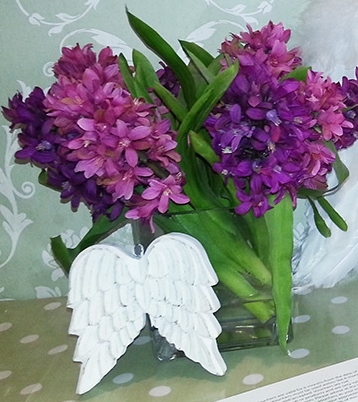 Once you have spotted the wings, email your answer along with your name and address to info@healths-angels.com. 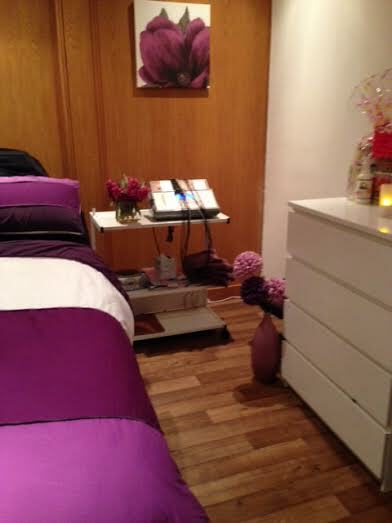 5 lucky winners (each recieving 25% of a two week course of 6 Rejuvadetox treatments) will be drawn on December 1st.